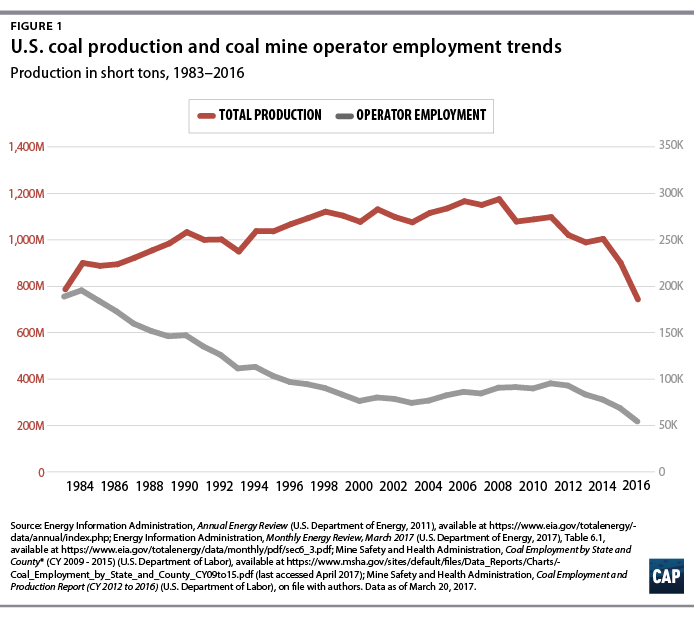 The U.S. coal industry has undergone significant changes in the past several decades. In recent years, these changes have accelerated due to transformations in the U.S. and international energy economy. They have left many coal communities in the lurch, particularly those dependent on labor-intensive underground mining in Appalachia. President Donald Trump campaigned on promises to revitalize the U.S. coal industry and bring back coal mining jobs. On March 28, he signed an executive order that began the process of rolling back key federal efforts, including the Environmental Protection Agency’s, or EPA’s, Clean Power Plan to reduce carbon pollution from the U.S. power sector.1 Despite the rhetoric and political theater that accompanied the order’s release, it will likely have minimal impact on the coal industry and coal mining jobs, given the structural economic challenges the industry faces. By contrast, President Trump’s fiscal year 2018 budget blueprint would have unequivocally negative impacts on communities that have struggled economically due to the coal industry’s downturn. The budget would gut the federal economic and workforce development programs that are most targeted and active in their support of these communities. 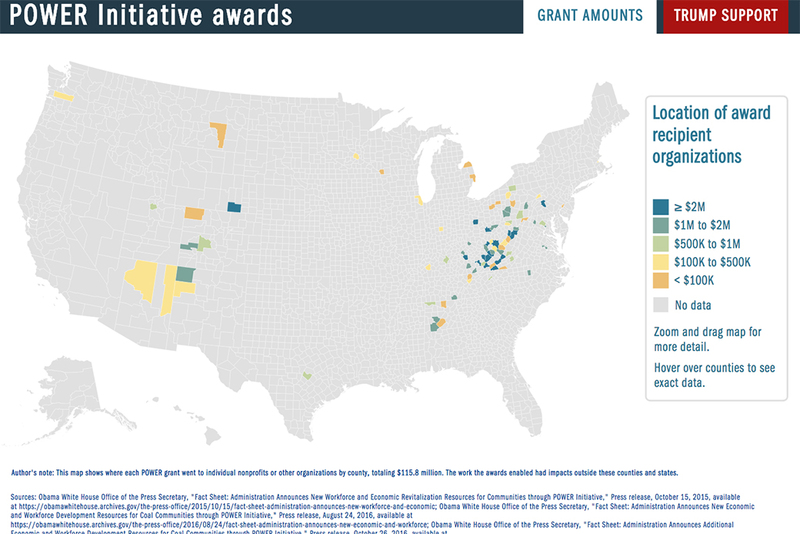 It proposes eliminating all federal discretionary funding—the entirety—of 7 of the 12 federal programs that coordinate investments and other forms of assistance to support coal communities. During the last two years, these programs have worked under the aegis of the Obama administration’s Partnerships for Opportunity and Workforce and Economic Revitalization, or POWER, Initiative to grow new businesses and industries, create jobs, and train dislocated coal economy workers for in-demand occupations. This issue brief looks first at the history and current state of the coal industry. It then discusses why President Trump’s actions would not restore coal country—and how they threaten current federal efforts to aid coal communities in transition by investing in their economic and workforce development. Pollution standards to protect air and water quality. For too long, the coal industry had a free pass to pollute. In 2011, under the requirements of the Clean Air Act, the EPA set the first limits on power plant emissions of toxic mercury, which can harm the neurological development of children.15 Federal agencies also have issued standards to protect rivers and streams from coal mining waste and limit carbon pollution from power plants, but these were finalized well after the most recent wave of coal mining layoffs in central Appalachia. Having promised “to stop the regulations that threaten the future and livelihood of our great coal miners,” President Trump filled Cabinet positions at the U.S. Department of the Interior, the U.S. Department of Energy, and the EPA with coal proponents.21 He has signed bills overturning rules that protect streams from toxic waste from coal mines and that help prevent mining companies from bribing foreign governments.22 On March 28, President Trump signed an executive order instructing the EPA to begin the process of rolling back the Clean Power Plan, which set the first carbon pollution standards for existing power plants and incentivized a transition to cleaner sources of energy. Upon signing the order, he stated that it will help miners go “back to work.”23 But while his executive actions make it easier for coal and power companies to pollute, they will not change the market realities that challenge the coal industry. Perhaps most importantly, President Trump’s executive order will do nothing to address coal communities’ urgent need for public and private investment to develop and diversify their economies, provide education and training opportunities for their workers, and address the legacy costs of coal mining on their people and places. 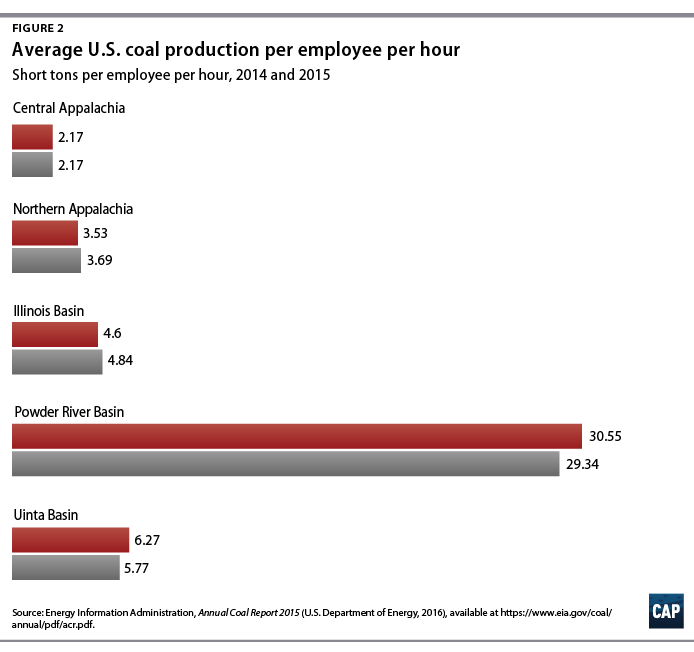 POWER defined the coal economy broadly, including communities associated with coal mining; coal-fired power plants; and related manufacturing, transportation, and logistics supply chain activities. The agencies involved in POWER worked collaboratively with key stakeholders in coal communities, including local governments, businesses and labor unions, planning and economic development organizations, workforce and job training providers, and community-based foundations. Together, federal agencies and local stakeholders identified and funded projects across various industry sectors that hold the promise of building a more economically diverse and resilient future for these communities. A foundational premise of POWER was the belief that successful economic development results from focusing on regional economic ecosystems and bottom-up strategies that leverage local and regional assets to the fullest. Congress failed to pass bipartisan legislation consistent with the biggest funding proposals of the POWER+ Plan. Senate Majority Leader McConnell blocked the Miners Protection Act from being included in successive omnibus spending bills, despite the fact that the legislation would have fulfilled the federal government’s long-standing commitment to backstop health and pension benefits for retired coal miners and their dependents, thousands of whom are Kentucky residents.38 In the House, Rep. Hal Rogers (R-KY) introduced the Revitalizing the Economy of Coal Communities by Leveraging Local Activities and Investing More, or RECLAIM, Act, which mirrored President Obama’s proposal to invest in AML cleanup projects tied to economic development strategies.39 It gained bipartisan support and considerable attention from coal country but did not advance. These interactive maps illustrate the impact of the POWER Initiative in coal country. On March 16, 2017, the Trump administration released its FY 2018 budget blueprint, which provides a broad outline of the administration’s funding priorities.43 In explaining how decisions were made about proposed spending cuts across the entire federal budget, Mick Mulvaney, the director of the Office of Management and Budget, said, “When you start looking at places that we reduce spending, one of the questions we asked was, can we really continue to ask a coal miner in West Virginia … to pay for these programs?”44 Given that explanation and President Trump’s professed support for coal country and coal miners, it is startling and contradictory that the budget blueprint—although it does not provide details on all relevant budget line items —defunds the very programs that are most actively helping economically struggling communities and workers in coal country. As shown in Table 1, the Trump budget proposal would eliminate $1.13 billion in funding for seven federal programs and/or offices, in part or in entirety, that provide direct, economic, and workforce development assistance and other services to coal miners and their communities.45 The Trump budget blueprint does not expressly eliminate the other five federal offices in the POWER Initiative, but top-line funding levels specify additional cuts and, where not specified, suggest almost certain cuts when the full budget is released. For example, the 5.6 percent cut estimated across the Department of Energy may apply to the energy jobs and workforce development activities that contributed to the POWER Initiative.46 The cuts definitely include non-POWER Initiative programs that aid coal country, such as the Weatherization Assistance Program, which saves low-income families—a disproportionate number of whom live in coal country—an average of $283 per year on home energy costs.47 The budget’s rollback of the POWER Initiative programs would stunt economic revitalization where it is needed, and additional cuts to other assistance programs would compound the economic challenges facing coal communities and the families who call them home. There is no canary in the coal mine to warn against the unfounded promises President Trump has made on the campaign trail or in office. 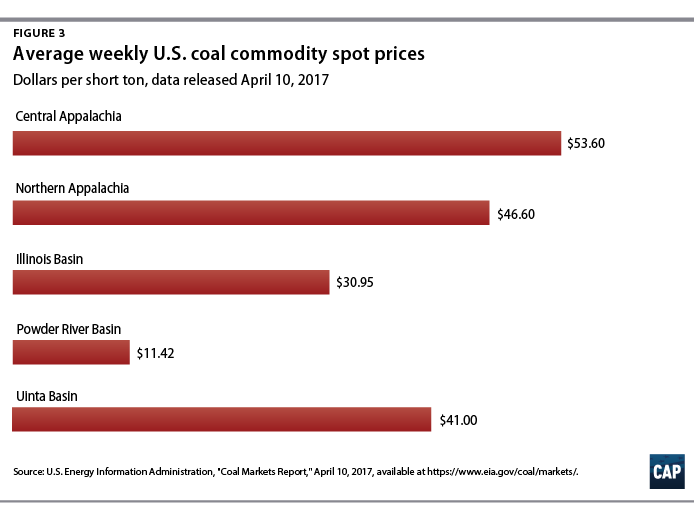 Market forces have shifted coal production and employment away from Appalachia, and President Trump’s budget would cut vital funding aimed at revitalizing these coal communities and helping them move into the future. 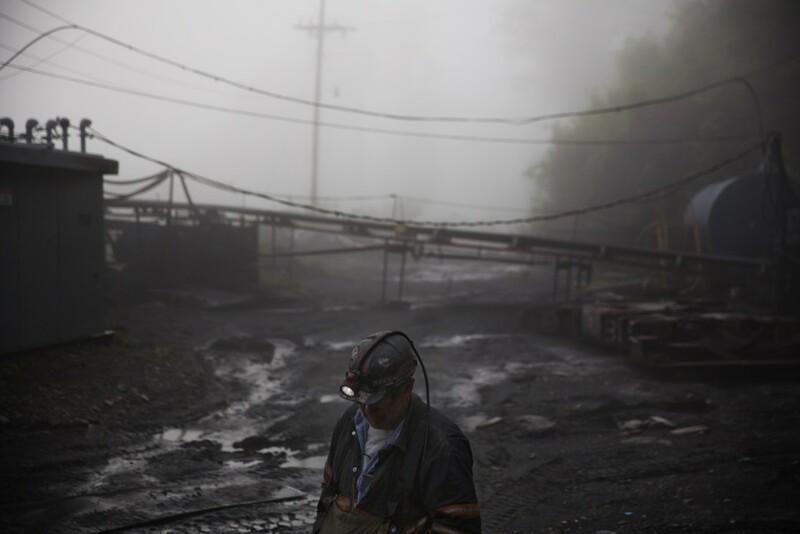 Without facing reality and continuing to invest in actual pathways that would lead to coal country’s economic development and diversification, the president will leave those communities and workers even further behind. Luke H. Bassett is the Associate Director of Domestic Energy Policy at the Center for American Progress. Jason Walsh is the National Policy Director at The Dream Corps. He was a senior policy adviser in the White House under President Obama, where he helped design and coordinate the POWER+ Plan and the POWER Initiative. *Correction, April 24, 2017: This sentence has been corrected to state that Congress appropriated $90 million in 2015 to the three states with the highest numbers of unreclaimed AML sites. **Correction, April 24, 2017: This sentence has been corrected to state that the POWER Initiative grants and awards have enabled efforts of more than 120 organizations.